Optiphase Products - World’s leading instrument for measuring interferometers and fiber stretchers. OPTIPHASE offers the most extensive line of fiber stretchers available in today’s market. It begins with a family of 3 stretcher platforms designed to span a fiber stretch range from 0.14 mm to 6.40 mm (standardized to single mode fiber, applying maximum voltage drive). These piezo-electric fiber stretchers offer enhanced modulation while maintaining a high operational frequency for a wide range of interferometric measurements and sensing systems. Our fiber stretchers are designed to operate with a bipolar voltage drive and are unique in that they do not require proprietary drivers. For most low voltage applications (< ± 15V) our stretchers can be driven by standard electronics such as signal generators, op-amps or other laboratory equipment without modification. Each stretcher platform, (PZ1, PZ2, PZ3) supports a range of operational wavelengths from 600 nm to 1625 nm with an extensive variety of fiber choices including Single Mode (SM) fiber, Polarization Maintaining (PM) fiber in both Panda and Bowtie types, as well as Reduced Cladding (RC) SM fiber for the most extensive stretch value. 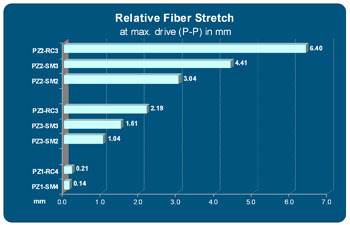 Fiber termination choices include bare leads, FC/PC or FC/APC connections for all fiber types.